I, an insatiable Anglophiliac since my days in the womb, left my 1999 trip to London obsessed with three things. Not Savile Row. Not high tea. Certainly not Harrods. No...it was the foreign-sounding chains that got my heart pumping. Wagamama. Muji. Pret a Manger. Now that there are two Prets within two blocks of my office, that's old hat. Muji's in SoHo. C'est la vie. Wagamama's still teasing me, but after opening a billion locations in the U.K. and every country around the world, it's finally encroached on American shores (albeit, Boston/Cambridge). (Wahoo!). 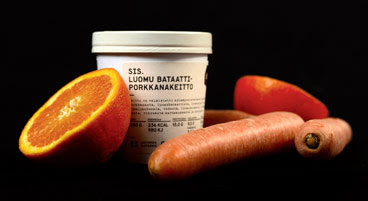 Now it's Finland's turn to feed my need for a new well designed nosh pit. Those tasteful scouts at Monocle point out Sis. 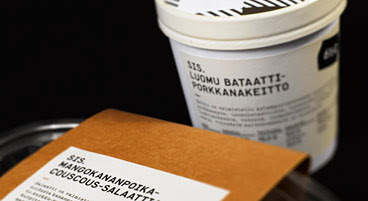 The sister-owned Helsinki mini-chain excels at perfect packaging and delicious-looking healthy bites. I love the check. Reminds me of a Hästens.